Chimps, pigs, and octopuses are often cited as some of the most intelligent animals in popular culture, but did you know that crows -- eerie, Hitchcock-esque crows -- are also considered one of the brightest species? According to Alex Taylor, a crow intelligence researcher at Auckland University, we might be wrong to rank apes number one in terms of animal cognition; crows are actually better problem solvers. "Humans love to try to rank animals on intelligence, but from an evolutionary perspective each species has a mind that is sufficiently intelligent to come with the challenges faced by its lifestyle," Taylor said. "But, to play the game, crows generally perform in very similar way to primates." 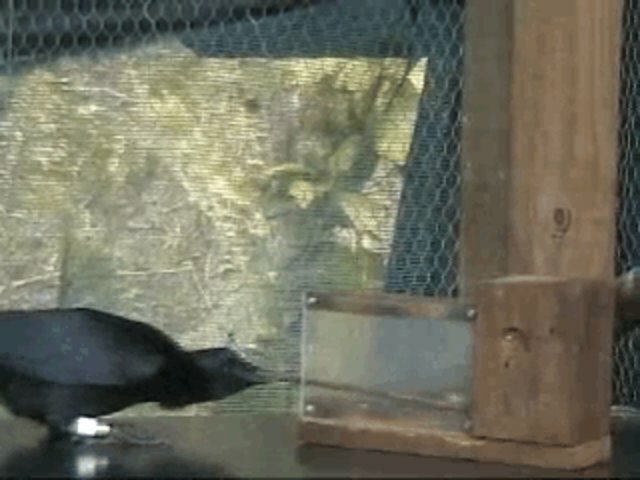 They don't perform similarly in all respects, though: Taylor's research has shown that crows -- specifically, New Caledonian crows -- are capable of complex causal reasoning, an important mental ability that allows them to find, create, and use tools to solve problems; the birds are the only non-human animals that have demonstrated this ability. According to Taylor, this type of reasoning makes crows the most sophisticated problem-solvers in the animal world, if not the most inquisitive. "Interestingly, crows are not particularly curious, and in fact they are rather scared of new things," Taylor said. "However they really pay attention: they are always watching what is happening around them, and once they are given a problem they do appear to have the ability to pause and think before they try out a solution." Taylor and his colleagues specialize in devising problems for the birds, most of which involve rewards (usually grubs). "We generally don't train them to solve problems, per se, but we create environments and let them figure out for themselves how to get food," Taylor explained. "For various studies we give the crows experience with the basics of a problem and then see what happens when we make the problem more complex." He's found that once the crows understand the basics of the problem at hand, they're able to apply what they've learned about the situation in creative and flexible ways, unlike any other animal.